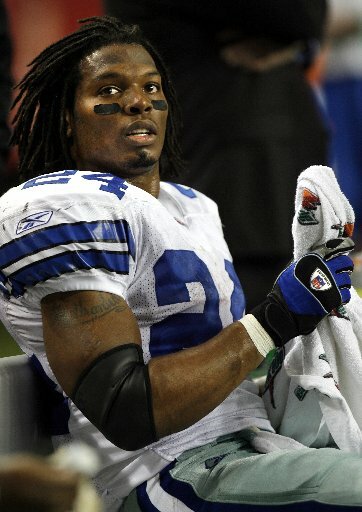 Marion Barber is the running back for the Dallas Cowboys and was picked in the 2005 NFL Draft in the 4th round 109th pick overall. 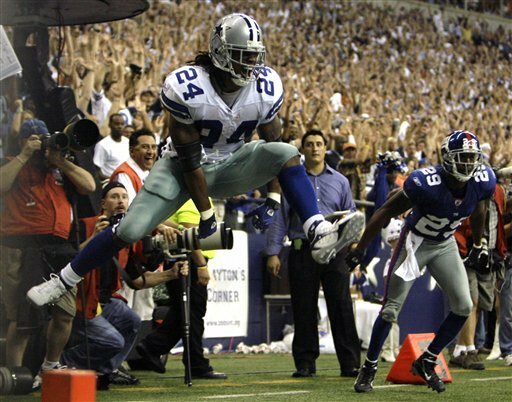 In his three years with the Dallas Cowboys, Marion Barber has become a local fan favorite, due to his work ethic, his hard running style and his nose for the endzone. With his crazy hair flowing out of the back on his helmet, his high leg kicks and his brutal stiff arms, Marion Barber III is the kind of runner that football fans love to cheer. Barber is a terrific blocker and pass catcher, so he’s what football coaches call a "complete" player. The only thing lacking from Marion Barber’s football profile is a lack of speed, which is the major reason he fell into the 4th round. Because he might not be able to break off long runs, there remains some question whether Marion Barber will be the long term answer at feature back. But playing in a top NFL offense which has a lot of other stars for the defense to defend (Romo, T.O. and Witten), Marion Barber III should get plenty of opportunities to produce. He should get lots of goal line touches and a considerable number of pass receptions. If only he can stay healthy and Felix Jones doesn’t wolf too many carries, Marion Barber might be worth a low first round fantasy draft pick. Barber attended the University of Minnesota from 2001 to 2003. His freshman year he saw action in eleven games when he scored seven touchdowns with 742 yards rushing. His second year was disappointing as he pulled his hamstring in only the third game of the season and was granted a medical red shirt for the remainder of the season. The following season in 2003 the hamstring showed no signs of slowing him down as he rushed for well over a 1,000 yards and scored a school record of 17 touchdowns. In his final season at the University of Minnesota Barber rushed again for over a 1,000 yards and ended the season with eleven touchdowns. He decided to not attend the University of Minnesota for what would have been his senior year and opted to be included in the 2005 NFL Draft. It should be considered that he was splitting time with future New England Patriots running back Laurence Maroney while at Minnesota. After a less than exceptional start to his Dallas career an injury to Julius Jones and the lackluster performances of Anthony Thomas gave Barber a chance to shine, and it was then that he took the position as back up running back for his own. The 2006 season saw Barber solidify his position with his ability and quality as a power back. The league was witness to the best third down rusher and extremely effective red zone player with the ability to score (he led the NFC with 14 rushing touchdowns). Last season, Marion Barber was influential in the Cowboys season, though his touchdown total was down somewhat from the year before. In fifteen games he rushed for 975 yards in 203 carries with ten touchdowns to go with that. He also had 275 yards from receptions with an additional 2 TD�s. He had by far broken more tackles than any other player from last season, but that is why he is �Marion the Barbarian�. He was also named in his first Pro Bowl even though he was officially the backup. Julius out Felix in, that is one of the focal points on Marion�s fantasy evaluation. As you can read below, despite my status as Big Cowboys Fan, I predicted that Marion Barber III would be a 1st round bust in 2008. The idea was that this was a guy who was a big injury risk as a starter, given the way he runs the ball, and that Barber would lose carries to a talented rookie even in an injury free season. You don’t draft platoon runners in the 1st round of fantasy drafts. Expect more of the same in 2009. The Dallas Cowboys gush over Felix Jones and the kid is crazy fast and quick when he’s on the field, and Jason Garrett caught a lot of grief in the offseason for the way he used Felix Jones before Jones got injured for the season. So expect the Cowboys to push Felix Jones on the field a lot more this season. That doesn’t necessarily mean that Marion the Barbarian is going to lose a lot of production. With Terrell Owens gone, the Cowboys claim they are running it a bigger percentage than last year – so Jones might be taking touches and production away from the receiving corps – not Marion Barber. Marion Barber will be the goal line back on an offense that’s been in the Top 5 the last two seasons (despite last year’s disappointment), so he’s got a lot of upside and should score 12-15 touchdowns, if healthy. But expect that he’ll get dinged at times this year, and the Cowboys might take a downturn with T.O. out of town. You’ll still have to draft Barber in the 2nd round to have him this year, and I would prefer to draft Felix Jones a few rounds later. I love Marion Barer, but spend those 1st and 2nd round picks on guys that are on the field every play. This season sees Barber as the number one for the first time at Dallas and that can only be a good thing for his fantasy value. Despite not starting and sharing time with Julius the past few seasons, Barber has put up solid fantasy numbers. Assuming that Barber is the workhorse back and Felix comes in as the change of pace type of guy, Barber could end up one of the very top guys this fantasy season. It will be interesting to see if Barber can keep up his 4.8 average yards per carry. If so, then if you assign him 300 touches, Marion Barber III could get somewhere around the 1,500 yards mark plus double digit TD�s. I would assume he could get 50% more touchdowns than last year, so his ceiling is around 15 touchdowns. Marion Barber also is very good on the receiving end of passes, so his value goes up a little in points-for-receptions leagues. Barber will be in an offense that has been Top 5 in the NFL the past two seasons, and Tony Romo will provide good stuff to him so he is sure to have at least 40 receptions. Even if Barber and Felix share the workload, Marion Barber should end the season with at least 250 carries and somewhere between 40 and 50 receptions. After a 13-3 regular season last year, Jerry Jones and the Dallas Cowboys expect to make the Super Bowl this year. If that’s going to become a reality, Marion Barber has to come up huge for the Cowboys in his first year as a starter. So the question remain: can Marion Barber be a Super Bowl caliber running back? Marion Barber – First Round Bust? That being said, I see Marion Barber as a trendy pick this year. It’s hard to project Barber’s numbers as a backup and say they will continue as the focus of the defense. Now that Julius Jones is gone, Barber becomes the starter. Projecting his numbers as a backup to Jones would indicate that Marion Barber should be a first round running back. I don’t know about that. Barber got much of his yardage late in games after the defense was worn down, and without breakaway speed, it’s hard to see him maintaining the 4.8 yards per carry average. First of all, Marion Barber is slow. He doesn’t have another gear, unlike many of the runners we’ve covered. Second, the Cowboys have stated they don’t intend on Barber being the every down guy. They expect new draft pick, Felix Jones, to split time with Barber. Barber will probably start the game, but his workload might not be that much different from the previous two years. The one time last year he carried the ball the entire game — the playoff game versus the New York Giants — Marion Barber wore down in the second half. I think the Cowboys coaching staff will protect him by running Felix Jones a liberal amount. Marion Barber catches a lot of balls, so you should take that into account when drafting him. But unlike every other runner in the first round, Marion Barber might be in a platoon situation, so I don’t think he’s worth a 1st round selection in a fantasy draft. If he falls into the second, you might consider drafting him. Frankly, if you were going to draft a Cowboys runner, I would suggest you wait several rounds (6th or 7th round, at least) and draft Felix Jones, instead. He should be the better bargain for where you can draft him. And if you draft Marion Barber, definitely pick up Felix Jones, just to hedge your bets.